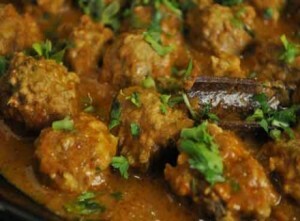 Chicken Kandhari Kofta recipe by Nazia Nazar at DesiRecipes.com. Steamed mince ball of chicken cooked in creamy gravy. Mix cinnamon powder, one teaspoonful of salt and minced chicken thoroughly. Divide the mix into twelve equal portions. Shape them into balls (koftas). Keep the koftas aside. Heat oil in a pan. Add boiled onion paste and cook till onions turn pink. Add gingergarlic paste. Saute for a minute, then add coriander powder and red chilli powder. Stir in tomato puree and cashewnut paste dissolved in a little water. Cook for five minutes on a high flame, stirring continuously. Add one and half cups of water and bring it to a boil. Add chicken koftas and cook for ten minutes, stirring occasionally. Add garam masala powder and pomegranate syrup. Correct seasoning. Simmer for five minutes. Stir in fresh cream. Serve with naan or parantha. Make cashewnut paste by soaking halfcup cashewnuts in water for half an hour. Grind it to a smooth paste. You do not need to use expensive full cashewnuts , you can use cashewnut pieces (tukda).